GSM Roofing is a private, family-owned, professional service company, specializing in the installation and maintenance of commercial and specialty roofing. We are known by our passionate dedication to customer service, commitment to our employees, support of our community and world-class professionalism. Our exceptional employees will deliver exceptional results while always striving to do the right thing. Founded in 1946, we operate in the South Central & South Eastern PA, MD, DE and NJ region with a full scope of services that includes roof service & maintenance, re-roofing, new construction roofing, historic restoration and custom metal fabrication. 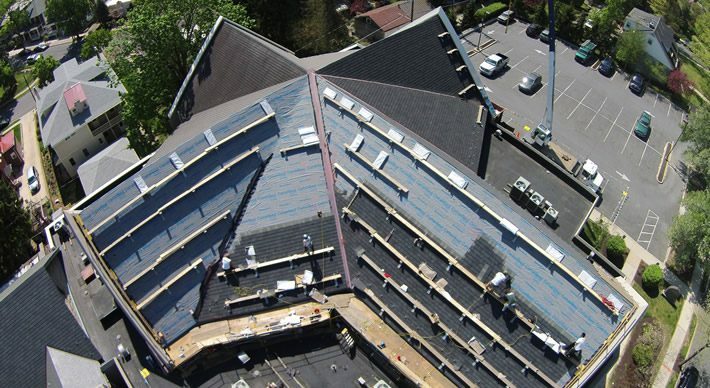 GSM also offers roof safety solutions and other building envelope products. Led by the third generation of the Gooding family, GSM has the essential credentials, exemplary safety records and fully trained & equipped people using industry-best practices to give you the confidence that GSM Roofing will complete your job expertly, safely and professionally. Put us to the test. Many have over the years, and have become long-time customers. And some of our greatest advocates.